Apple iPod Nano 3rd Generation. Type: Lithium-Polymer. Voltage: 3.7 V. Capacity: 450 mAh. Height: 42 mm. Width: 42 mm. Depth: 2.5 mm. Price: £10.50. Postage and packing included. Construction: 1 x 450mAh Li-Ion cell, three wires with trimmed and tinned ends. Plastic case opening tool included. Fits: 3rd generation iPod Nano devices. This iPod Nano 3rd Generation battery Lithium-Ion MP3 battery is a DIRECT replacement for the original Apple batteries. This iPod Nano 3rd Generation battery is soldered to the iPod motherboard. If you have basic soldering skills you will be able to replace this battery. It is not recommended, however, for anyone who is not confident of their ability to solder. Also the silver back of the Nano is thin and easily bent so it is important that you are confident in your dexterity before you attempt this battery replacement. This iPod Nano 3rd Generation battery uses the latest Lithium-Ion technology to give an outstanding 450mAh power capacity - exactly the same rating of the original Apple battery. For other iPod batteries see here. 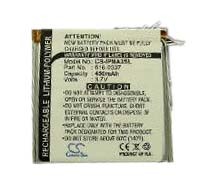 This iPod Nano 3rd Generation battery comes with a one year manufacturer's warranty. The iPod is a media player first produced by Apple in October 2001 and designed by Jonathan Ive. 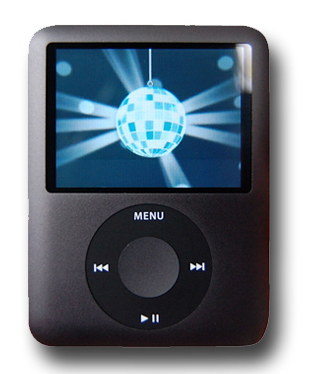 iPods are instantly recognisable by their small size and minimalist appearance. At the time of the iPod's release , other MP3 players were relatively large, as their hard drives were usually 2.5" as opposed to iPod's 1.8". The iPod is so popular that by April 2008, it had sold 151,000,000 units.